Still of the test footage. In 1992, Pixar and a company by the name of "Hi-Tech Toons" made test scenes of the movie Toy Story. 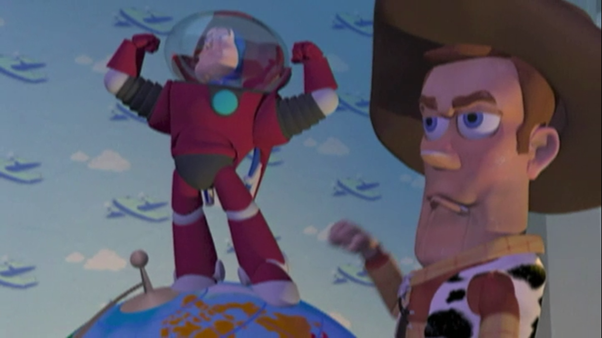 These designs are drastically different than the ones seen in the final product (notably, Buzz is smaller and in a red spacesuit and Woody is a ventriloquist doll). What little test footage is available is similar in tone to the infamous Black Friday Reel. There is also test footage of Buzz being voiced by Billy Crystal, Pixar's first choice for the role (Tim Allen would voice Buzz in the final product). It's currently unknown how much more test footage exists.